We have modified gold nanoparticles (AuNPs) with triazole acetamide to obtain a material for the sensitive and selective colorimetric determination of iodide. The functionalized AuNPs were prepared by a reductive single chemical step using a Cu(I)-catalyzed click reaction. The presence of iodide ions induces the aggregation of these AuNPs and results in a color change from wine-red to purple. The iodide-induced aggregation can be detected visually with bare eyes, but also by photometry. The detection limit is as low as 15 nM. The method displays excellent selectivity for iodide over other anions due to the selective interaction with the amido groups of the triazole. The method was applied to the determination of iodide in spiked lake waters. 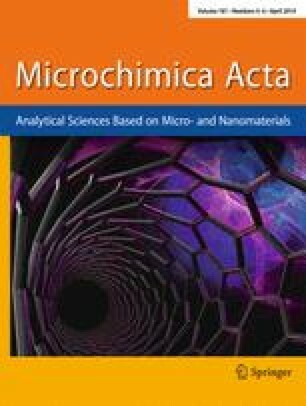 New triazole acetamide functionalized gold nanoparticles (ATTP-AuNPs) for sensitive and selective colorimetric detection of I− were developed. ATTP-AuNPs showed excellent selectivity toward I− due to the interaction between the amide groups of ATTP and I−. The online version of this article (doi: 10.1007/s00604-013-1150-0) contains supplementary material, which is available to authorized users. We gratefully acknowledge the financial support of the National Science Council (ROC) and National Chiao Tung University.